The city of San Marino, the capital of the Republic of San Marino is so small that most of the world doesn’t know it exists. When they do hear about it they think it is part of Italy. Not so! The Republic of San Marino, one of the smallest countries in the world, is now completely independent of Italy, and proudly so. If you would like to read more about our visit to San Marino, click here. San Marino may be small and often unheard of, but it packs a punch, with stunning 360-degree views over the lower valley and towards the Adriatic Sea. The food up on the mountaintop is mostly of Italian influence, which comes as no surprise. I was however surprised when I heard that a one-star Michelin restaurant existed here. Restaurant Righi is where fine dining happens in San Marino. The restaurant is run by chef Luigi Sartini, a quiet, shy man who lets his food do the talking whilst his capable front of house staff are hired for their ability to keep the diners engaged and happy. After a leisurely Aperol Spritzer at our hotel, the Hotel Cesare, we made the short walk up the cobbled street to Restaurant Righi, located right on Liberty Square. Being able to stay in the Old Town is terrific when you are dining out here, with a quick walk home after a few wines much easier than driving back down the mountain or catching public transport. Restaurant Righi is a two-part operation. On the lower level, the mood is casual at the traditional osteria, with the al fresco diners spilling out into the piazza. As we squeeze our way through the diners, already with bowls of steaming pasta in front of them, the staff from the upstairs restaurant are ready to greet us. With a formal Maitre d’ the key to the front of house team, we are looked after with precision all night. Our dinner tonight is a degustation, a style of eating that is highly favoured here as it allows the chef to showcase as many different foods and experiences as possible. The dining room is intimate, with room for around 50 people at any time. 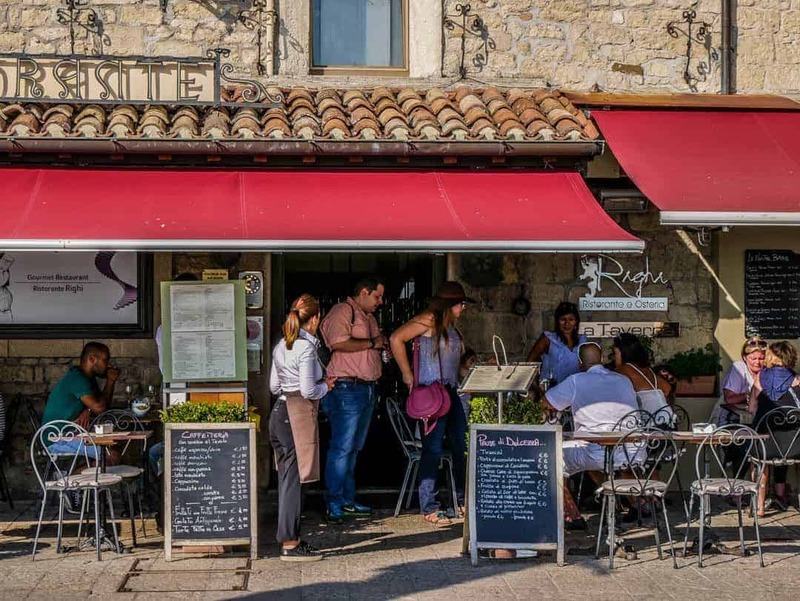 The stone walls, typical of the buildings in San Marino create a warm and inviting space in which to eat. Soft lighting via candles and elegantly understated decor completes the scene. From the kitchen, rich aromas permeate the area of what was once a post office. Tip: If you are able, request a table by the window for a fabulous view with your meal. Bread is placed on our table as soon as we are seated. Bread, like most European countries, is a staple here and served with every meal. When I’m back home in Australia, I yearn for good bread. Real bread. When I’m here, I eat more than I normally would as it’s simply too hard to resist. It’s constantly replenished throughout the meal. Amuse-bouche is an artistic masterpiece and I sit and admire the carefully cut egg shell, housing the smooth, orange-red Pappa al Pomodoro. I imagine an apprentice who drew the short straw, sitting out the back, their daily job to wash egg shells and slice off the top without cracking them. I’m intrigued by their success rate! The Tuscan inspired tomato soup is silky in my mouth and gets the taste buds singing and wanting more. That’s the purpose of an amuse-bouche so it well and truly hit the brief. The plates are pieces of art, carefully put together with a level of delicacy not seen in everyday restaurants. I love the simple beauty of it all, but mentally note that many people I know would be left saying “where’s the food?”. Remember though, degustations often start off with the smaller, lighter offerings, gradually building up to more substantial plates of food. The next course arrived in a shower of bright red, green and yellow. 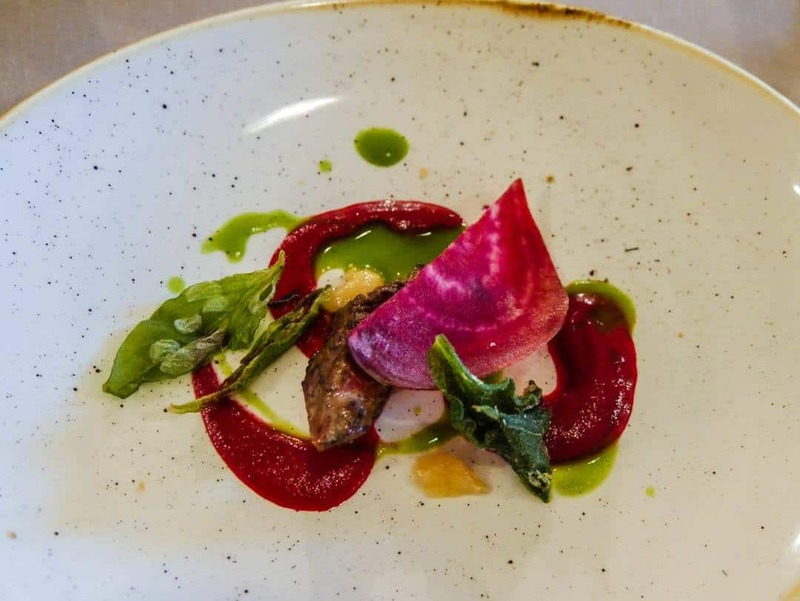 Leeks and red turnips were the centrepieces with a beetroot puree and lemon confiture bringing an array of flavours together. Another burst of colour, this time in shades of green announce the arrival of snails. Fried in a crumb with herbs, they unfortunately didn’t appeal to me one bit. My husband, who will eat almost anything, is polite enough to eat them, but they will never be on his best things to eat list. I am quite sure, however, that if snails are your thing, they would be delightful, as had been the food so far. The theme is seemingly green tonight. As the next course approaches our table, I am unable to work out what it is. It’s definitely green, it’s leafy, but there’s not much else to go on. As the Maitre d’ explains, “the surprise is inside”. Interest piqued, we cut into the small parcel, exposing what resembled yellow worms, but fear not, the worms were actually a type of pasta, made with cheese, eggs and lemon. A subtle chicory flavours could be tasted, along with the strong flavour of the sheep’s milk cheese. Tying it all together was fresh broad beans. The courses were becoming more substantial by this stage. Next out was the risotto and I could immediately smell the sea. Al-dente rice, cooked the way I like it, was sitting loosely in a carrot and beer sauce. I love risotto, but the strong seafood smell was not doing me any favours. Calamari pieces topped the risotto, and the intense liquid that is squid ink was poured on top. However, despite not being a shellfish fan, it was the dollops of hops applied quite liberally over the risotto that made this dish unbearably bitter. Our fellow diners all agreed. This was the course that we eventually singled out as being the least enjoyable, with the bitterness crucifying any other flavours that may have been pleasant to the palate. When I looked at my husband’s plate, I saw a lover of risotto and seafood leave food behind. Never a good sign! One of the special moments of our night here came when the chef made a personal visit to our table. This is a common occurrence, with Luigi Sartini knowing how important it is to engage with his customers. It’s a time when he can ascertain how his food is being received. For those who love the whole food experience, meeting the chef adds another dimension, and Chef Sartini is at the forefront of this practice. He’s shy, he doesn’t speak much English, but it’s a delight to listen to him. When he learns we are from Australia, he is keen to tell us about his time spent in Melbourne years ago and how much he loved it. In a complete turnaround, the next course was possibly the best of the evening. Lamb, always a favourite to an Australian, was cooked beautifully. 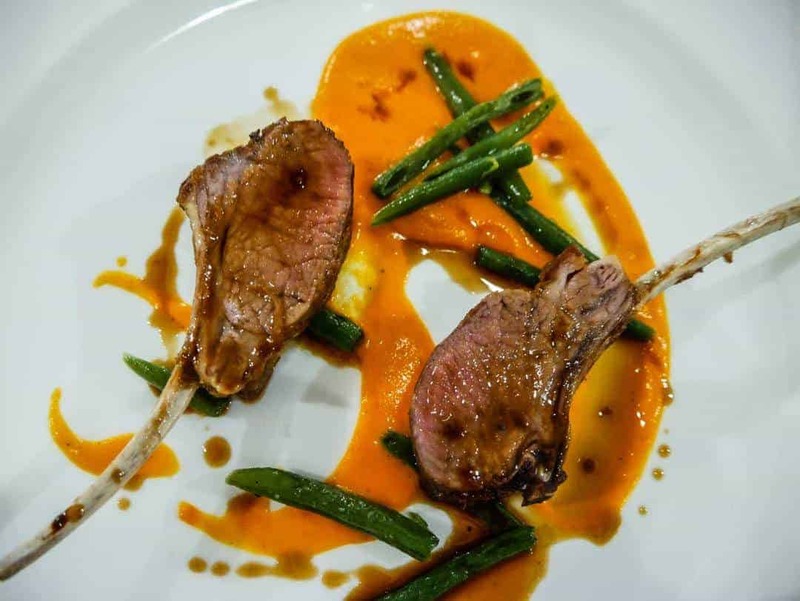 Two cutlets, sitting on a silky red pepper puree, served with green beans and an anchovy sauce. The ingredients all worked so well together and I loved it. No dinner experience like this would be complete without dessert. This one was a winner, but it wasn’t going to be too hard to please me with a chocolate ensemble. Caramelised chicory white chocolate cream, dark chocolate ice cream and barley coffee ice cream was a trio of dessert decadence. Throughout the degustation course, wines are matched in accordance with what you are eating and if you are interested, the sommelier will also discuss the wine pairings with you. Restaurant Righi is one of the best places to eat in San Marino and the number one fine dining restaurant. With a focus on using traditional methods overlaid with a modern twist, his use of seasonal, local produce sets him apart from other restaurants in the area. If innovative food experiences are something you love to do, I recommend giving this restaurant a try. If you are a little like me and can be fussy with some ingredients, or if you have specific dietary requirements, it’s always best to discuss with the restaurant staff upon booking. Wow, that’s a lot of food but I’m guessing that the portion sizes are calculated perfectly to give you just enough! I think I would have also declined the snails and its such a shame that the risotto wasn’t to your liking as this is one of my favourites! Lovely pictures though Kerri, thanks for sharing! yes they are quite smallish sizes really so quite able to eat them all! And now I’m hungry. ? Love the ingenuity of the leaf parcel. What a pleasant surprise! The restaurant looks like it has a cozy atmosphere too. Ah, thank you for introducing me to San Marino. You are right like most people I did not know this is an independent country. I would have assumed it to be a part of some European country. Food looks lovely and well presented. I wonder why the Michelin Star restaurants always serve such small quantities. I think in this case it’s because it was a degustation menu, not a regular a la carte. I always find the best restaurants in a city in the old town – it must be a thing! 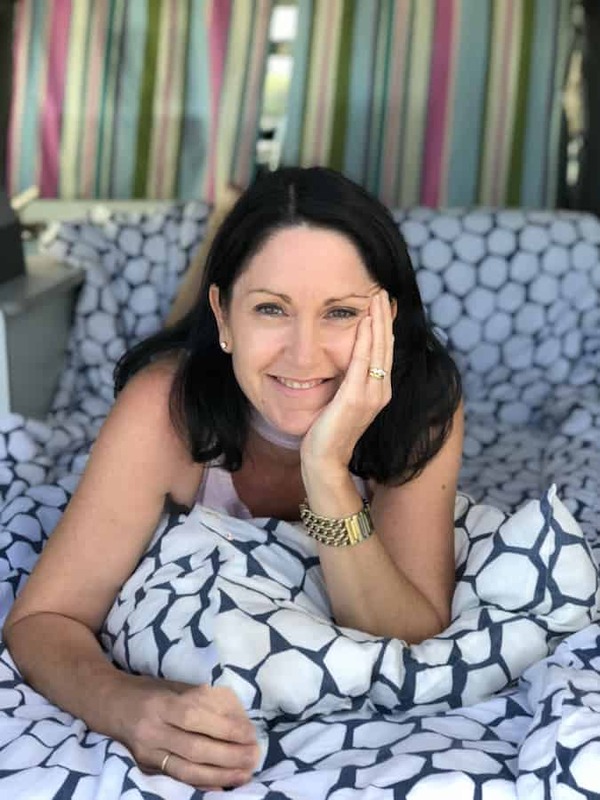 Restaurant Righi sounds wonderful, and I love that there’s the option of more casual al fresco dining as well as fine dining. The bread looks like an incredible starter – I’ve never eaten a degustation menu, but it sounds like a wonderful way to sample the menu. Each plate really is a piece of art – so colorful, and very simple yet elegent. Hats off to chef Luigi Sartini! As an Australian, I do appreciate how good that lamb dish looks – can’t wait to dine! How have I never been to San Marino? I live in France, for goodness sakes. This food looks awesome! I get really tired of French food and want that seafood risotto. Just added San Marino and Restaurant Righi to my list. It’s amazing how we miss what is often under our nose! I was waiting to see what kind of worms come out of the green leafy covering while reading your post LOL. But although worms sound pretty umm..well, not so great, they LOOK quite good! Almost like crispy fried chicken. I think I’d try them out. they weren’t really worms 🙂 it’s ok! I like how one delightful dish after another kept coming. We crossed St Marino blissfully unaware of its existence as an independent country. I love degustation menus! It’s always good to have your boundaries pushed, perhaps not in the case of your risotto, but the good things is that there is always another course! I love the little parcel with the pasta worms (although glad they weren’t actually worms)! I’m not a fan of chocolate desserts, but that does look spectacular. San Marino, and Restaurant Righi are sure to receive a visit from me in the future! I would so LOVE to visit San Marino so I’ll check out your post on that, but this meal looked incredible! I mean the restaurant is lovely but the food looks divine. I loved the pasta filled parcel (YUM! ), but like you I think I would have struggled with the snails tbh. I’m a total foodie so I’ll add this to the bucket list. The dining experience looks awesome Kerri. I had no idea this country existed. Big time world traveler here, eh? LOL….seriously though, I’d no clue the Republic of San Marino. Learned something new today. It’s so small and hidden it’s easy enough to do. I’m sure there are plenty I don’t know about either! I am still thinking about those apprentices cutting the egg shells & washing them ! Truly the art of perfection .